Rotational spectroscopy provides accurate identification of the constituent molecules in a gas mixture, as well as the ability to study moment-by-moment chemical reactions within the test chamber. One of the challenges of this application is the requirement for very high dynamic range on the acquisition system, due to the very wide range of amplitude of the spectral lines. Researchers make use of averaging to extend the dynamic range of the oscilloscope, which then places performance demands on the oscilloscope to perform hundreds of thousands to millions of acquisitions in the shortest time possible. New techniques continue to be created to extend the application of microwave spectroscopy. Today, researchers are now focusing on analyzing chemical reactions on a moment-by moment basis. Tektronix is tracking this work new features and functions in real-time scopes to support these changing needs. Reduce acquisition time on static samples with hardware averaging and "Summary Frame"
Rotational spectroscopy involves transmitting microwave or millimeter wave chirps through a gas sample, acquiring the received signal with a broad-band signal acquisition system, converting the time domain data to frequency domain, and finally, performing a pattern match of the acquired data against theoretical spectral composition of specific molecules to identify the actual contents of the gas sample. Tek offers real-time scopes that can directly acquire signals up to 70GHz. These instruments may allow the elimination of up/down converters, thereby reducing one potential error element and noise source from the signal path. Time evolution of the CP-FTmmW signals of HCN, HNC, and HCCCN following photodissociation at t = 0 of CH2CHCN obtained in the fine time resolution mode of the spectrometer. Reprinted (adapted) with permission from "Time-Resolved Kinetic Chirped- Pulse Rotational Spectroscopy in a Room-Temperature Flow Reactor" published in the Journal of Physical Chemistry Letters. Copyright 2018 American Chemical Society. Rotational Spectroscopy requires a lot of signal averaging to extend the dynamic range of the acquired signal. Normally this averaging would result in long acquisition times, however proprietary technology, available on all Tektronix high/ultra-performance real-time scopes, uses hardware averaging built into the acquisition board to speed up data collection. With the “Summary Frame Only” mode available as a standard feature in Tek scopes, the acquisition hardware performs a point-by-point average across all frames, and provides a summary frame with an extended dynamic range and improved signal-to-noise ratio. If only the Summary Frame data is required, substantial time is saved by reducing the amount of data that needs to be transferred from the scope’s acquisition board to the scope’s internal PC system. Instead of transferring 1,000 fames, for example, you would only need to transfer the summary frame, resulting in a 1000:1 data reduction. Hardware averaging in the acquisition system provides very fast calculation, and “Summary Frame Only” mode results in a significant data reduction within the acquisition system, thereby requiring less time to transfer the waveform data from the acquisition board to the PC motherboard within the oscilloscope. Combined together, these two features dramatically improve analysis throughput. The evolution to moment-by-moment experiments, where researchers are analyzing chemical reactions, places even more demands on the amount of data collected compared to static sample analysis. Tektronix has developed “Orthogonal FastFrame Averaging” mode to address this new requirement. The scope creates a set of average frames, which is taken from the acquisition of multiple frame sets, dramatically reducing acquisition time. Once the averaging is complete, what remains is the Average Frame Set. Again, if 1000 sets of frames were acquired and averaged, the resulting Average Frame Set represents a 1000:1 data reduction for transfer to the scope’s PC board. Orthogonal FastFrame Averaging allows the user to perform efficient hardwave averaging of multiple sets of frames into a single Average Frame set. For example, each first frame is averaged together with all other acquired “first frames” on a point-by-point basis to produce an “Average First Frame”. This process is repeated for all other frames, producing high resolution data that represents each sequential state with as little as 6uS gap time between each frame. Acquiring the most spectrally-pure and amplitude-accurate data set requires compensating the acquired data with a correction filter. Tek offers two levels of solution to address this compensation. When using a Tek AWG and a Tek real-time oscilloscope, an automated program is available to produce a pre-distortion filter. This filter is then applied to the original AWG waveform data to produce a “pre-distortion” or “pre-compensation” waveform. This compensation automatically corrects for amplitude and phase variations caused by system elements (cables, up/down coverters, antennas, etc) between the output of the AWG and the input of the scope. 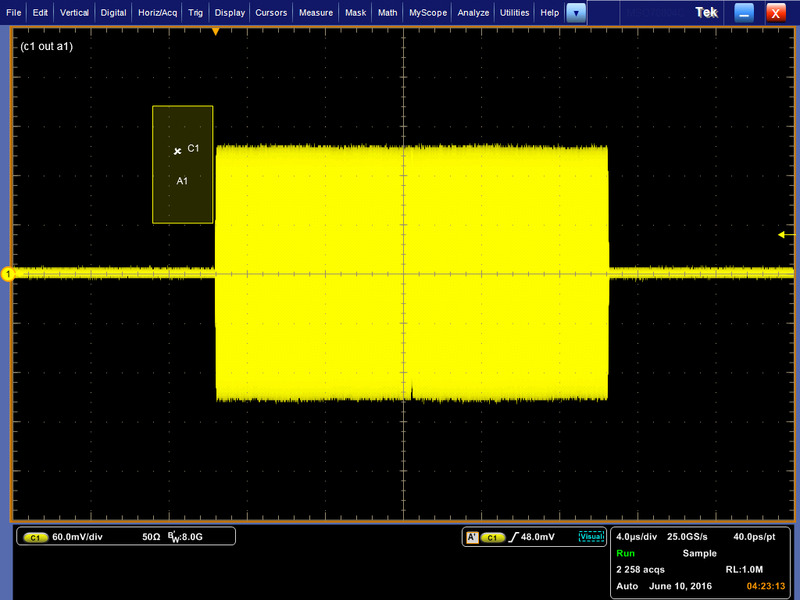 Because this technique modifies the signal being generated by the AWG, there is no impact to acquisition efficiency. An even more robust compensation tool is available, called Serial Data Link Analysis (SDLA). This tool produces a filter that corrects for amplitude and phase variations, as well as reflections. Input to SDLA is S-parameter data (typically produced using a VNA), and the output is a FIR filter that is automatically applied to the scope data with each acquisition using a Math channel on the scope. This can be applied to the final data set to minimize impact on the acquisition efficiency. The Precompensation process has measured the amplitude and phase response of the AWG and attached coaxial cable, built a filter to compensate for this response, and then pre-distorted the waveform so that the resulting output is flat. This application note will explain how the FastFrame(TM) Segmented Memory feature of the high performance scopes from Tektronix eliminate any compromise for you in the quality of the data acquired and the efficient use of the memory. DPO70000SX ATI Performance Oscilloscopes deliver the industry’s most accurate capture of high-speed signal behavior to verify, validate and characterize your next generation designs. Capture up to 70 GHz signals with the lowest noise and highest fidelity, ensuring the most accurate measurements of your signal’s true characteristics.